Didn't have much time for blogging last half year. Have been busy on pinterest, and also in making stuff, so I'll be posting some of the results here the coming period. Here's the first one, made it 10 years ago, but made a photo just recently. Finally I found some time to write down a tutorial for the shopping tote I made. 1. Start with cutting the fabric. I used a plastic shopping bag of the desired size as a template. 2. Mine had the size of 42cm by 57cm. The gap at the side is 4 by 14cm. The middle gap is 18cm wide. The top of the handles is on the fabric fold. 4. Sew the sides together, again with a french seam (flat felled seam). 5. Top stitch this french seam at the sides: it will look like this. 7. 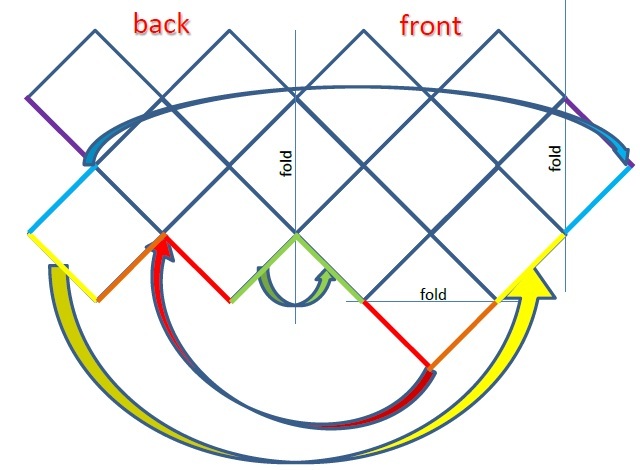 Fold a seam at the bottom inside the pleads. 8. Top stitch severel times to secure the bottom seam. 9. Use biais band to finish the sides of the handles of. 10. 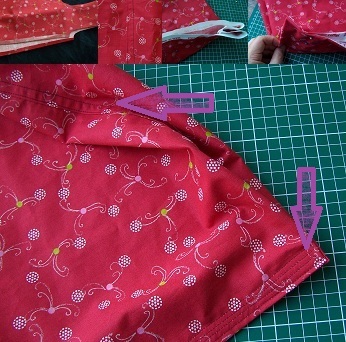 Fold the handles, and stitch to secure at the top. 12. ..... and easy to fold in a small package. Yesterday I wrote about the bag that I'm making. The handles are attached now, lining still to do. Here is the result so far (taking a nice picture with the bad light this time of year appears to be very difficult). I've been neglecting my blogging last week. I've been very active on pinterest instead (you can follow me here). I have been crafting last week, but I forgot to take photo's, they will follow later. And I'm busy with yet another crochet bag. Just attached the handles. Now the lining. 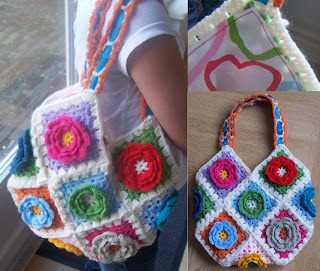 Some inspiring pins can be found in my board "bags"
Today I finished the granny square bag for my daughter. I have been combining some tutorials for this project. Here a wrap up of the project. So corresponding colors should be match and there are three squares that are folded in half to connect the front and the back. 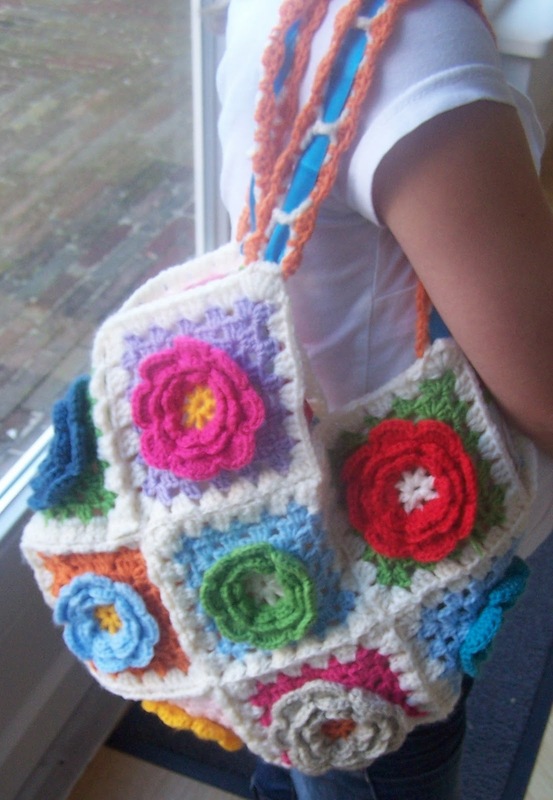 For the squares I used the granny square pattern that I found on Rose Hip. I understand from friends that they find it difficult to crochet 3D flowers and especially figure it out from the desciptions. Therefor I made a small tutorial. As I do not like to put all the squares together at the end, I joined them as I went. On attic 24 is a very clear tutorial on how you can join squares on the go. For the handles I made a chain of 84 stitches (beige), on the second row (turning) I repeated 4 chains, 1 triple crochet in each 5th chain of the first row. This made the 'ladder' for my ribbon. Then I used orange for the sides: 3 double crochets in the TC of the beige and then 1 single crochet around the 4 chain spaces. Finally, for the lining I combined two tutorials. It was very helpful to sew in the lining while the bag was inside out like was suggested in the tutorial on While they play. Further I found the tutorial of Future Girl very clear. Since yesterday I have a pinterest account. Have been filling it with stuff that I collected in a word document, which was a far from ideal way to save them.